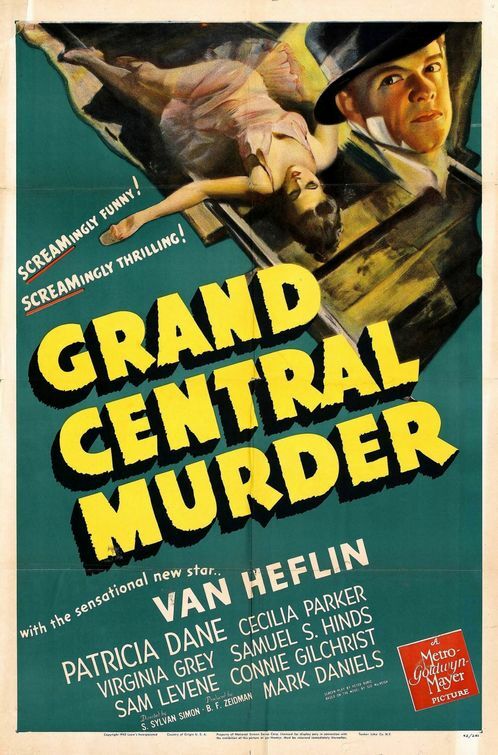 GRAND CENTRAL MURDER is a 1942 film based on a 1939 novel by Sue MacVeigh. Van Heflin is private eye “Rocky” Custer, with Virginia Grey as his wife, and Patricia Dane is Mida King, the dead body. Mida King(a stage name for King Midas, who had the golden touch) is an actress who’s a grasping, greedy, evil woman who specializes in taking men for all she can get, loving cash, furs, perfume, and expensive jewelry, which she sells immediately. Distrusting banks, she converts her money to thousand dollar bills and keeps it with her. She’s landed a big fish, millionaire David Henderson, and plans to marry him after the night’s running of her play, then heading west in a private rail car. The framework of the film is that old stand-by of gathering all the suspects together, then the rest of the film is each telling their story about the events preceding the murder. The body is found in that private car. The bundle of thousands is missing. And there’s a host of suspects. Her ex-husband(no one knows why she married him; he doesn’t have a dime) who works for the railroad where the car was parked. The stepfather, a “psychic,” who was always hitting her up for money(an ace of spades playing card, he carried a fistful of them, was slipped under her dressing room door). Her housekeeper, a woman who gave her her start when she was just another struggling young actress and now only gets room and board, no salary, for administering to her every need. The housekeeper’s daughter, Mida’s understudy. The producer, a hood type, another one of her “victims.” The new fiance, who overhears a conversation about a rich divorce in six months. Her fiance’s ex-fiancee, a rich girl who’d been engaged to him for years, only to be told that very night that he was marrying Mida. The ex-fiancee’s father, chairman of the board of the railroad, who had tried to buy Mida off with what she called coffee money. Turk(Stephen McNally in his first film role billed under his real name, Horace McNally), Rocky’s client, yet another male victim, and a man who’d been framed for a murder. He’d escaped from the detectives bringing him in and phoned in a death threat to Mida, causing her to run out on the play after the first act, fleeing to her private car. Rocky himself is even considered a suspect, having been spotted lurking around the theater and the car by the other suspects. Sam Levene plays Inspector Gunther, the police detective investigating the murder. Rocky and he seem to have the usual adversarial/friendly relationship these sort of tales require. Not a great film, but enjoyable. A comedy/drama combination, the two investigators bounce off of each other until Rocky finally solves the murder. All’s well that ends well. For more overlooked films and related stuff, check out Todd Mason over at Sweet Freedom.